My walking partner from the Northeast - Chris, or TFW to give him his WH ID - has been seriously ill since our last walk together on which we walked to England's newest mountain - Little Lingy Hill - via Carrock Fell, mostly in a foggy environment. That day he was off colour, tired, not himself as we walked a high level fells route on a miserable day, it was also the day that he told me he had just been diagnosed with cancer. All of a sudden the day seemed much more miserable and depressing than it had been with my quips regarding his lack of motivation now seeming insensitive, uncalled for, maybe even cruel in one way. Even though it came out of the blue the guilt was still there, I should have taken more notice of his days performance as Chris is usually a strong walker and chatty although we all have our off days now and again, a bad cold or too much ale the night before. How much better had this been the case today instead of the devastating news that had been thrust upon E and I. Within a week Chris was having his operation, the speed at which this happened endorsing just how bad the situation had been. The operation was a success and after a few days in the IT ward he had recovered sufficiently enough to begin making friendly dialogue with the nurses, and probably enough to be a bit of a pest also. After my weekly check ins regarding his health and well being it was tentatively suggested by Chris that he may be ready for an outing to which his consultant agreed that he was ready for it and it was not a bad thing for him to be doing, albeit gently being the order of the day. 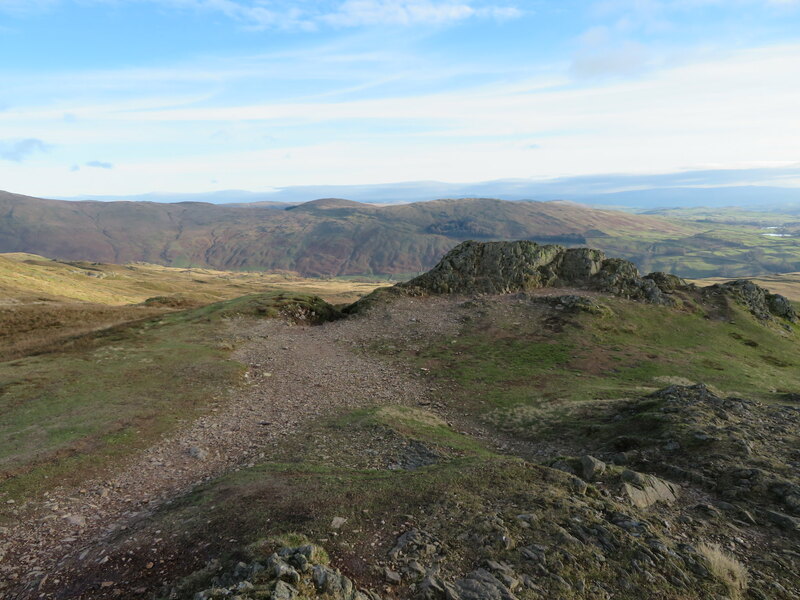 This was nine weeks after his operation so a day and a venue was set up, 3rd January 2019 with Wansfell the choice of a steady and easy climb to get him going again. 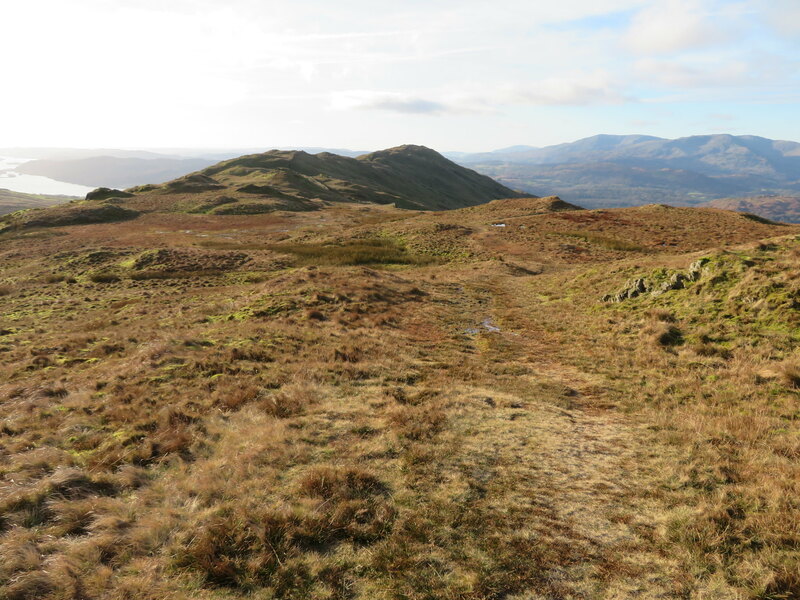 But it was not to be as he began to suffer from pains and an infection that had to be cleared up first as a priority over wanting to climb some hill in the Lake District. Damn the set back. After a few days of waiting Chris called me to say that he now had the all clear again for a walk on the hills so the date was set for Wednesday 9th January, a day when the weather forecast looked fairly good with the clear skies that are needed to enjoy the views from this 482 metre high fell overlooking Windermere. 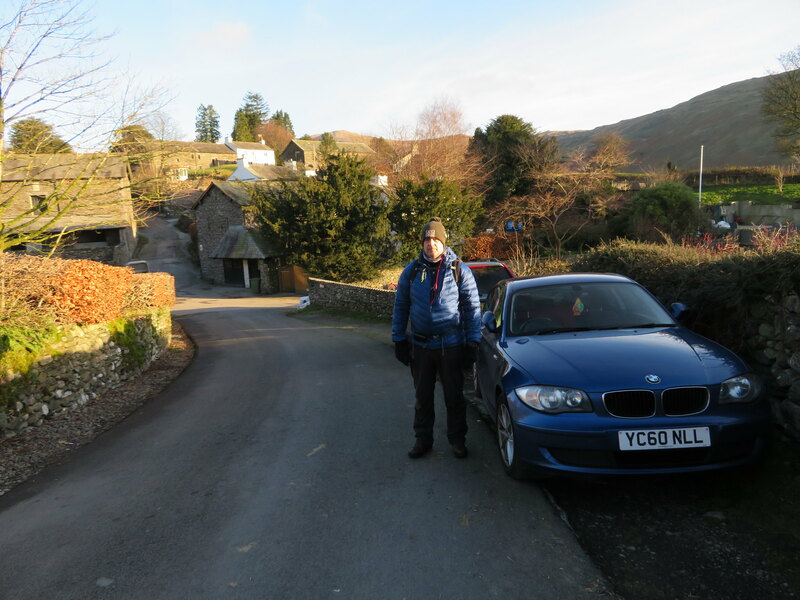 When Chris arrived at our house on a cold but sunny morning it was the first time in 11 weeks that he had set foot in Lakeland and it was obvious that medication and a long period of inactivity had taken their toll on him so this was going to be a very steady walk indeed. 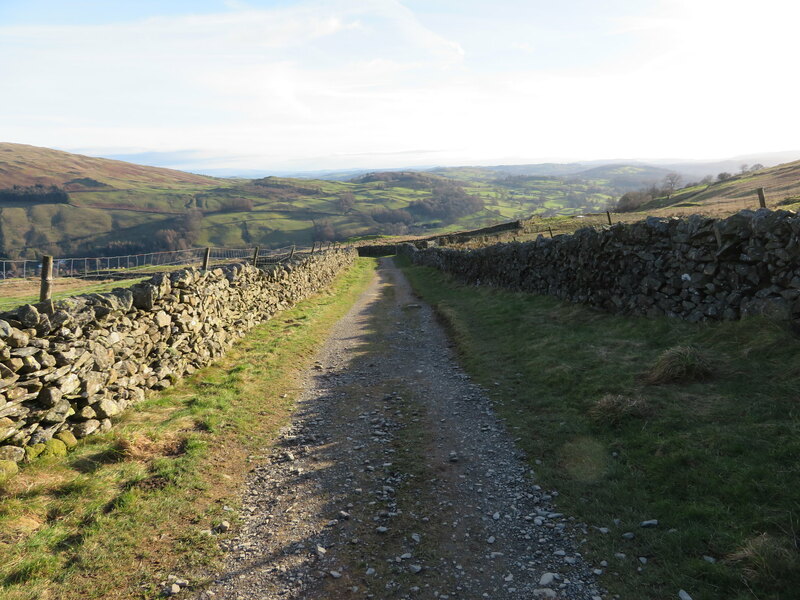 I chose this because it was to be short and easy with good tracks and paths throughout with not much height gain from our start at the Mortal Man Inn at Troutbeck, plus it would be a first time up for Chris. 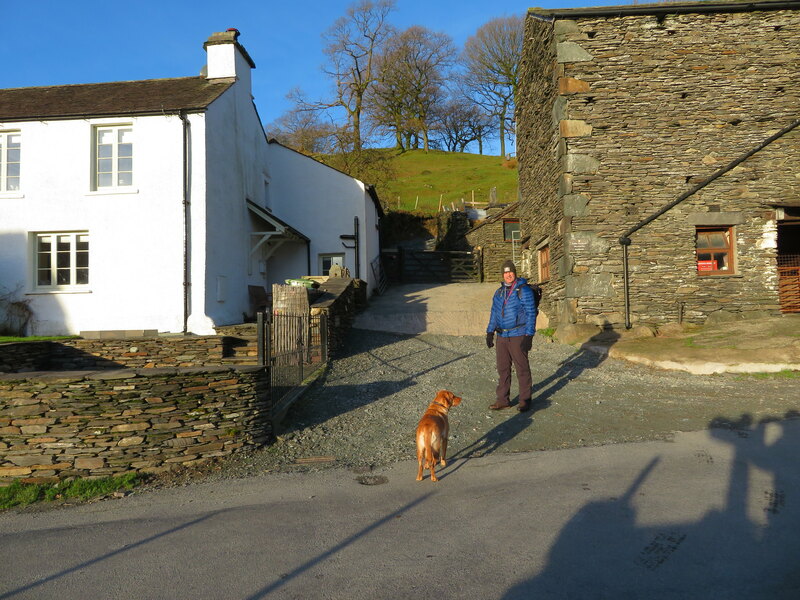 After the more than usual welcoming greeting on arrival, short catch up and a mug of coffee we were off to drive over Kirkstone Pass to arrive at the sparse car parking hamlet of Troutbeck, the part that sits east of the road below High Green with its white painted houses and cottages gleaming bright in the morning sunlight and eventually decided that we could park on a small and narrow patch of dirt alongside a wall just below the Mortal Man Inn without causing an obstruction on the very narrow lane at NY411035. It's always been tight for parking around Troutbeck but just a bit further south along the A592 there is a small lay by across from Limefit Caravan Park from where a short walk either back along the road or just a little further south to the church and then following either the path or the track will find you back at Troutbeck and the start of the walk proper. 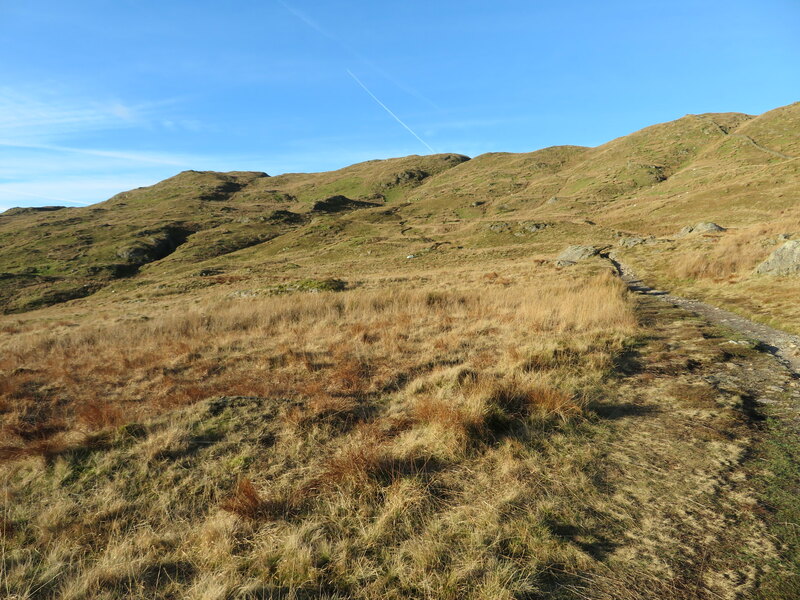 It was glorious with blue skies and the sun just about taking the edge off the 2°c chill and slight breeze that would both change as we climbed higher up the fellside, with the first reducing and the latter increasing. 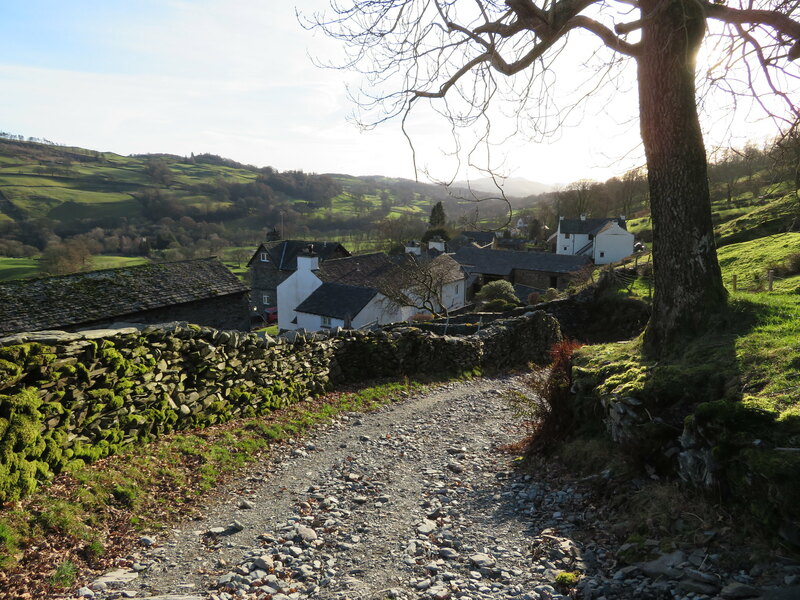 From the car a short walk south along the narrow metalled road towards Longmere Yeat soon brought us to the start of Nanny Lane between two houses, our main access route to Wansfell. From the start this was always going to be a very steady walk, and so it proved as we passed through the gate to enter into the realms of a well stoned up track sat between the confines of a natural rock boundary on the left and a beautifully adorned verdant green moss and fern covered wall on the opposite side almost certainly assisted in its growth by the shadow of the trees when in leaf that line the lane in these lower regions. It was like a curtain of green silk cascading down the wall. 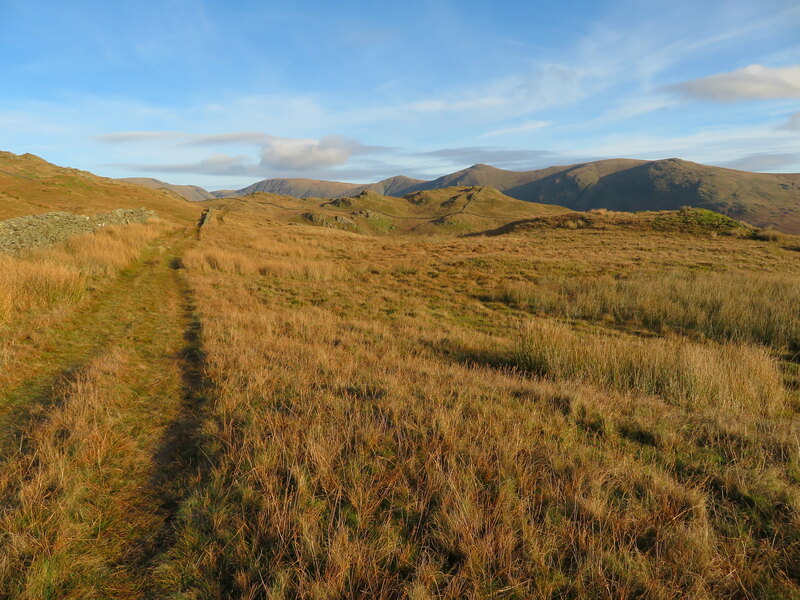 just before the skyline began to show the shape of the ridge of the three Kentmere mountains of Yoke, Ill Bell, and Froswick whilst they then ran out to meet the High Street range of hills. It was about this point that Chris had the call of nature and as it was quiet with not a soul about he did the obvious and pretended to be looking over the wall when suddenly the silence was broken by the sound of feet thudding down on gravel and upon looking up the lane saw a lady fell runner approaching at a fair rake of knots. She was fast gaining ground on Chris as he attempted to quell the quite substantial flow and tuck whatever he had quickly away with a red face and an apology of "I couldn't wait any longer" to which she laughed and continued on most likely thinking that there was nothing worthy of calling a halt. I couldn't help but give a grin or two as in his rush to cover up he had to suffer the consequences of a hurried withdrawal as the last remnants were released inside rather than outside his trousers. Such is the price of modesty. 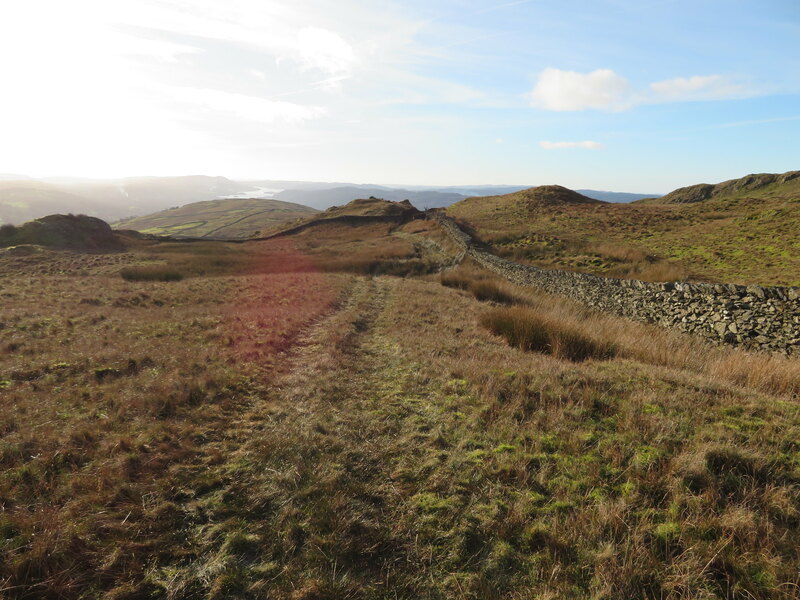 After a good few metres of steady walking with regular stops for photo opportunities the Wansfell ridge opened up before us and with the backdrop of a beautiful blue sky and a few fluffy white clouds the scene was perfect. 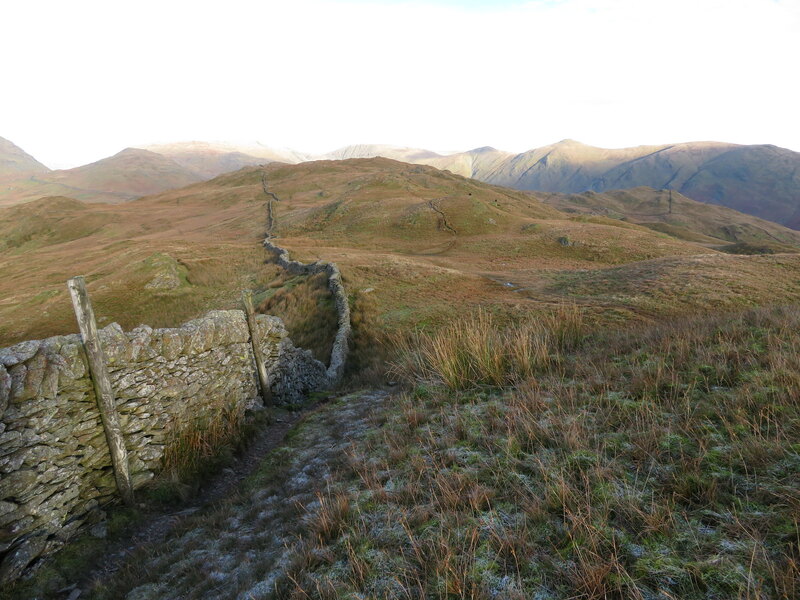 along the lane only leaving it when both walls ran out leaving only the one on the left hand side from where the now grass track continues on before turning west to pick up the ridge path to Baystones - aka Wansfell - and then onwards to Wansfell Pike itself. 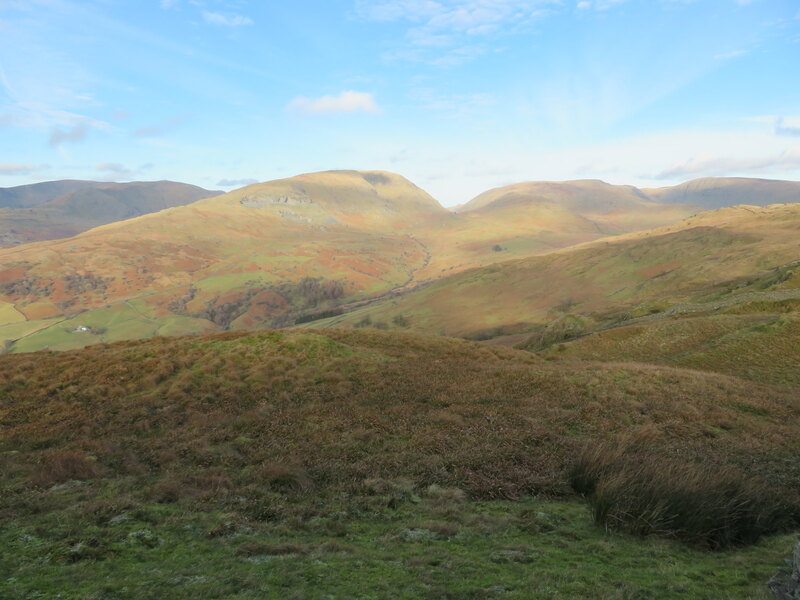 The views had opened up dramatically with the Kentmere fells and onwards towards High Street filling the north eastern skyline with the fell before us looking a beautifully coloured mixture of browns and greens. 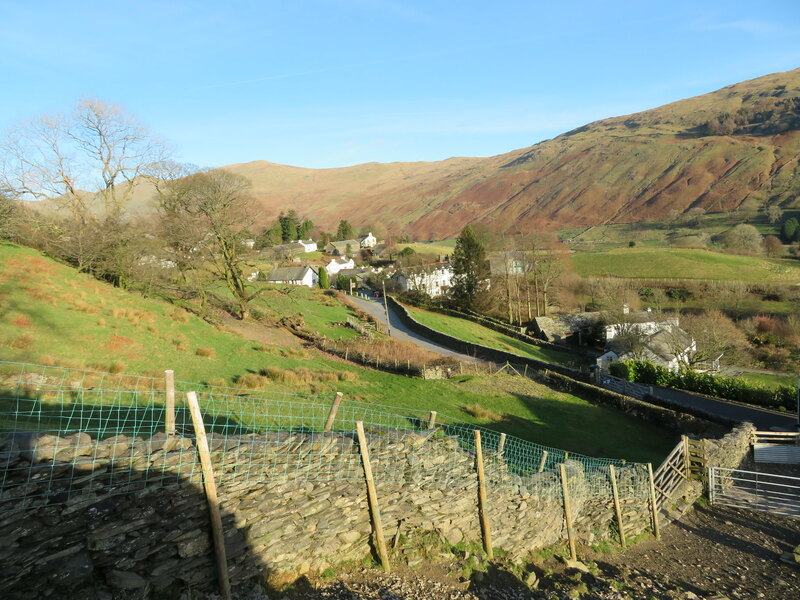 Dod Hill was looking most attractive in the distance and we contemplated having a go at that whilst we were around this neck of the woods as it would have given a good view along the Troutbeck valley. 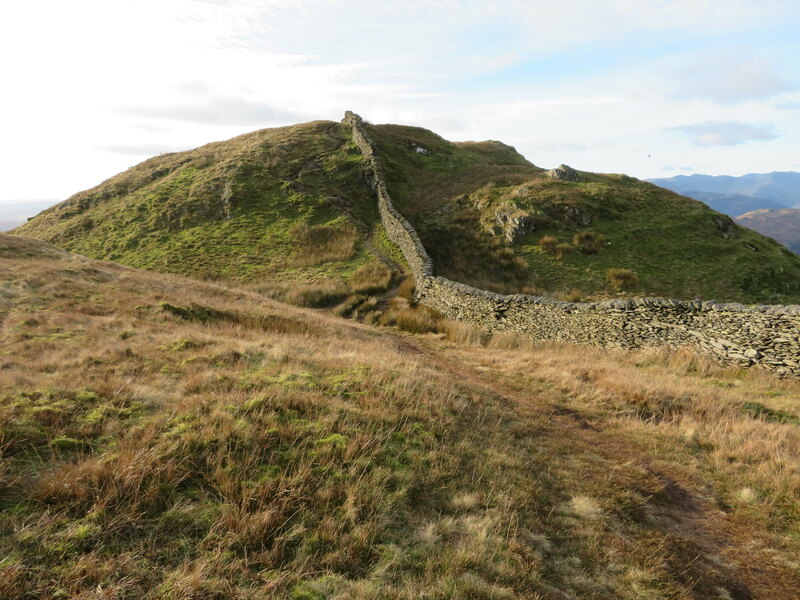 We walked on for a few metres to survey the obstacles ahead that included a couple or three dry stone walls, walls that didn't appear to have any gates in them so as I didn't want my walking partner to aggravate his already tender body by scaling walls we did an about turn back to the wall ladder stile that would allow access to the summit of Baystones. Walking back to the stile saw us looking at the lower end of Windermere over which the clouds were gathering in a formidable fashion. 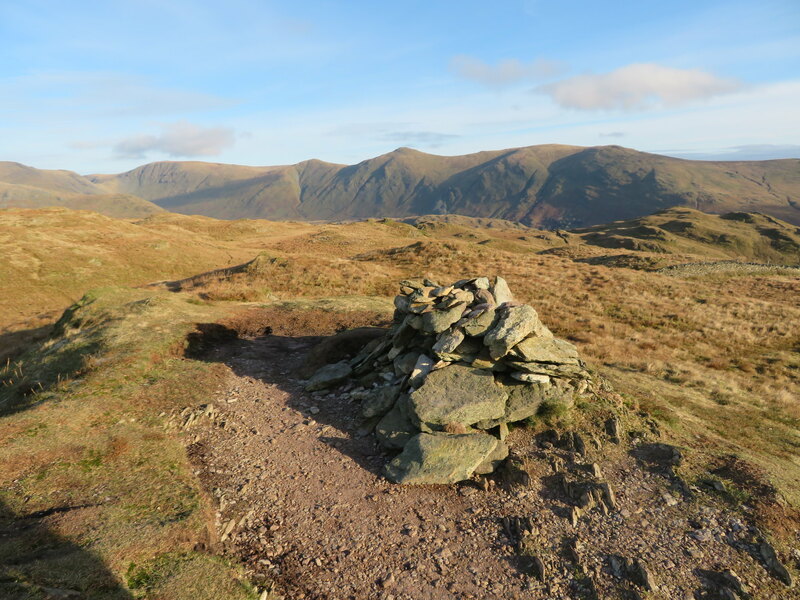 Chris was doing alright, puffing and blowing a bit and needing regular stops that allowed us to take in the scenes of the beautiful landscape and enjoying the peace and quiet of the fells, the cool air and breeze giving for sharp views in most but not all directions. 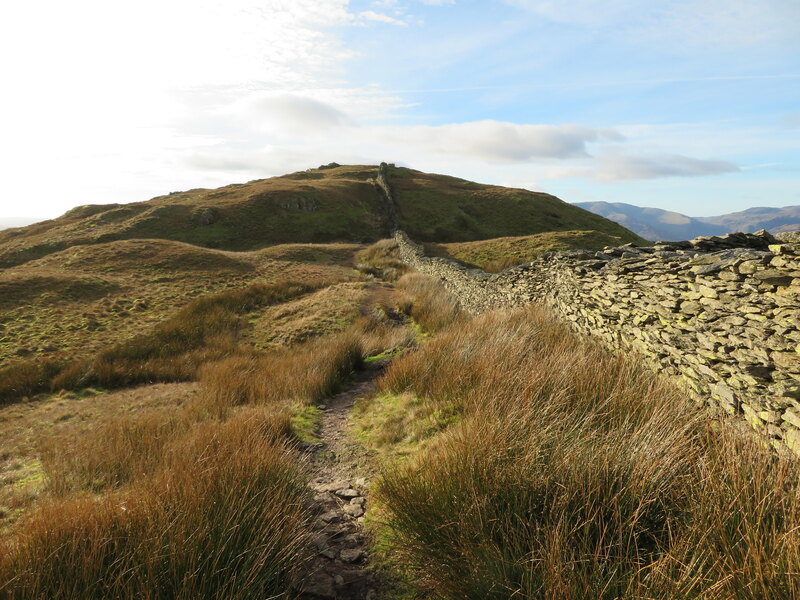 As we continued the short climb up to Baystones the ground around us proved to consist of numerous small hillocks and crags, a change from the usual smooth contours of the usual fellside. The path from the stile to Baystones summit is over grass and well graded but despite this it took us around 25 minutes to negotiate the 625 metres - just over 2,000 feet - long path to reach the summit, a tad slow under normal conditions but these were far from that and we were both satisfied on progress so far. As we got higher it became cooler and the ground was now getting harder and gaining a light covering of frost then as we topped out on Baystones summit the wind hit us, it was not a very strong wind but it was now a lot colder than it had been just a few metres lower and I would be glad when we left this top to start the climb along the ridge sheltered by the wall. 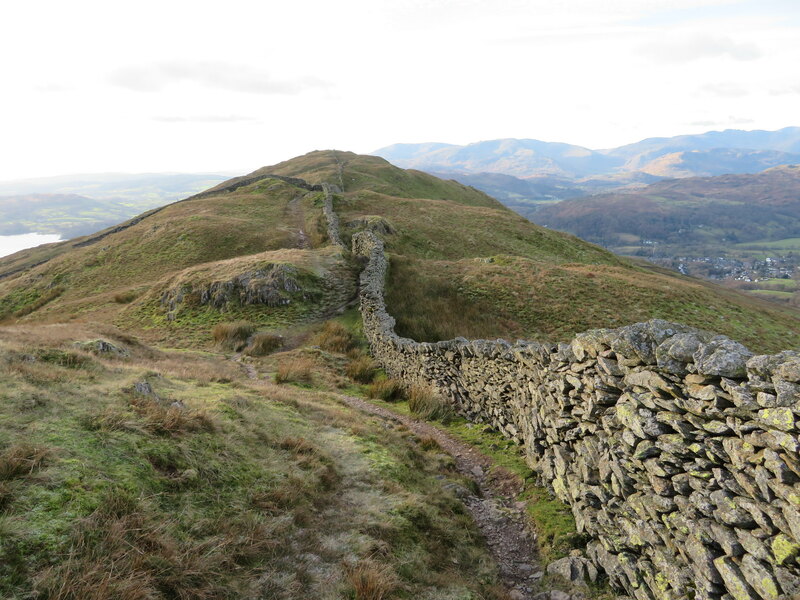 Baystones is 487 metres in height, 5 metres higher than Wansfell Pike at 482 metres but Wainwright chose this lower top as the summit due no doubt to its exceptional views across Windermere. 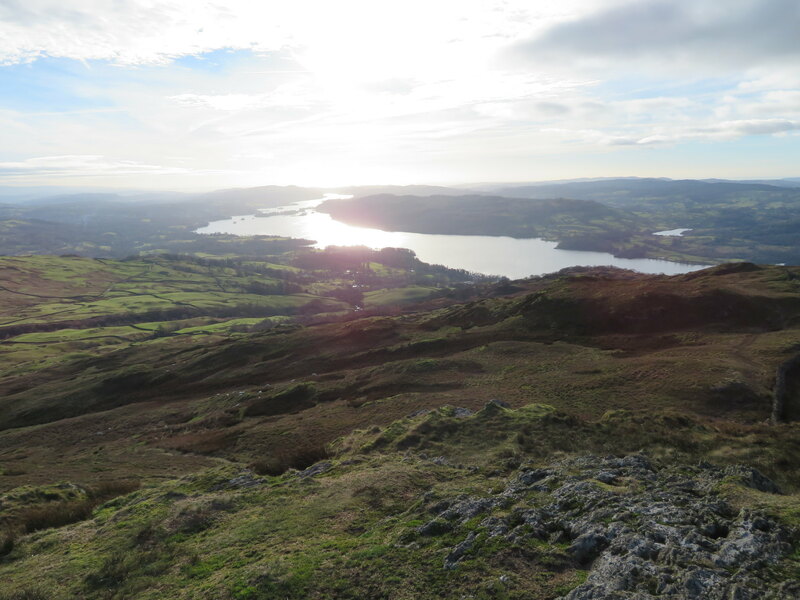 But here we were on the higher top and there is nothing negative to be said about the views from here, they are amazing, stupendous for such a small hill with views in all directions although the full glory of Windermere cannot be seen from this point. 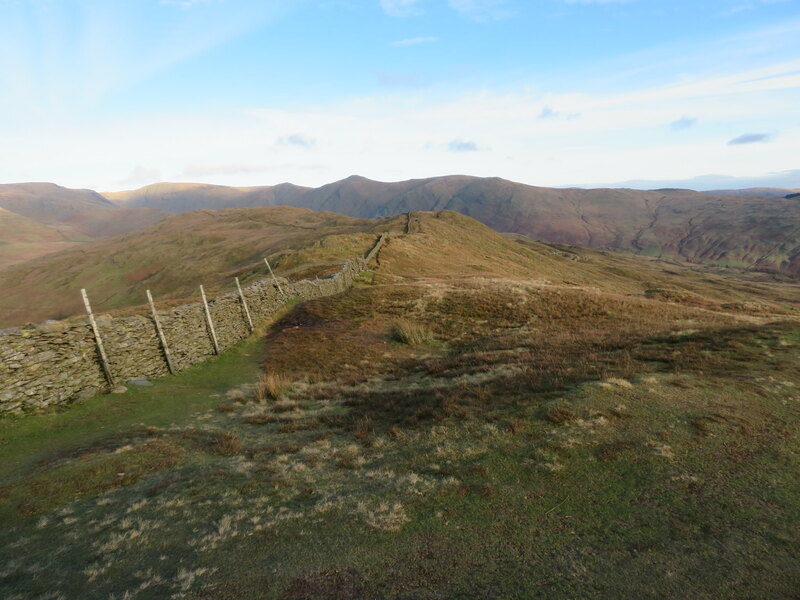 The Kentmere mountains to High Street, Caudale Moor, Red Screes, Fairfield and its eastern ridge. Swinging around there is a view across Ambleside and Grasmere with the line of the Central Fells and the loaf shaped hump of Great Gable poking up behind them. Further around still the Coniston Fells are to be seen. 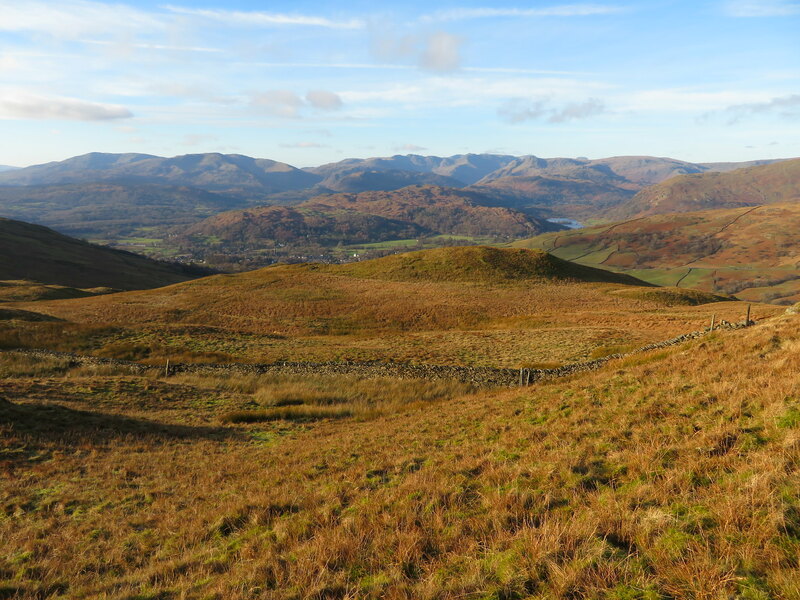 What a panorama, a panorama that will be seen in a little closer detail once we have arrived at Wansfell Pike itself. 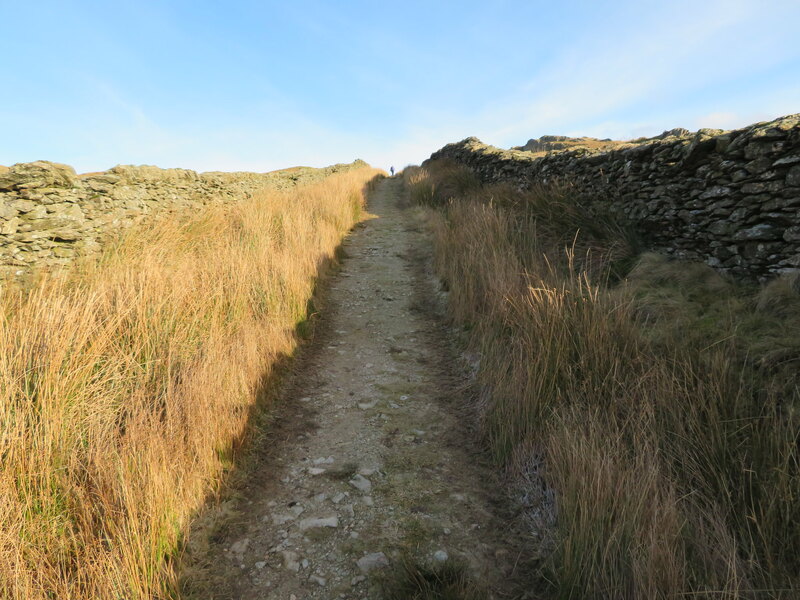 We didn't linger as we wanted to get out of the wind so off we went walking along the worn grassy path that soon dropped down into a hollow as it turned towards the ridges dry stone wall and some welcome shelter from the cold wind. As we followed the undulating path the ground got progressively whiter underfoot and about halfway between the north and south tops we called a halt in a hollow to give Chris a well earned rest and refuel. We sat and chatted in quiet contemplation with Chris feeling, I think, a little disappointed with his progress on this his first time out in 11 weeks. It's a familiar feeling to all those who have been very active and fit that when something like this comes along and when in recovery one's mind can't - or doesn't want - to accept that things aren't what they were, not just yet anyway. It's as though we have lost that invincibility, we are weak, useless, struggling to cope with even the smallest of exertions, puffing and panting whilst walking up the slightest of inclines instead of the usual vigorous bounding and striding out as in the past. Chris was, and will be again, a strong walker, someone who went up a hill like a rat up a drainpipe. The north ridge up Catstycam, Dale Head from the tarn, Great Gable from Beck Head to name a few, always in front, looking down on me, timing himself and then telling me his time and then mine as I crawl blathered in sweat over the top edge after my futile efforts to keep up with him. It's a nice walk along this ridge, easy with decent views. Soon enough our target is in sight. 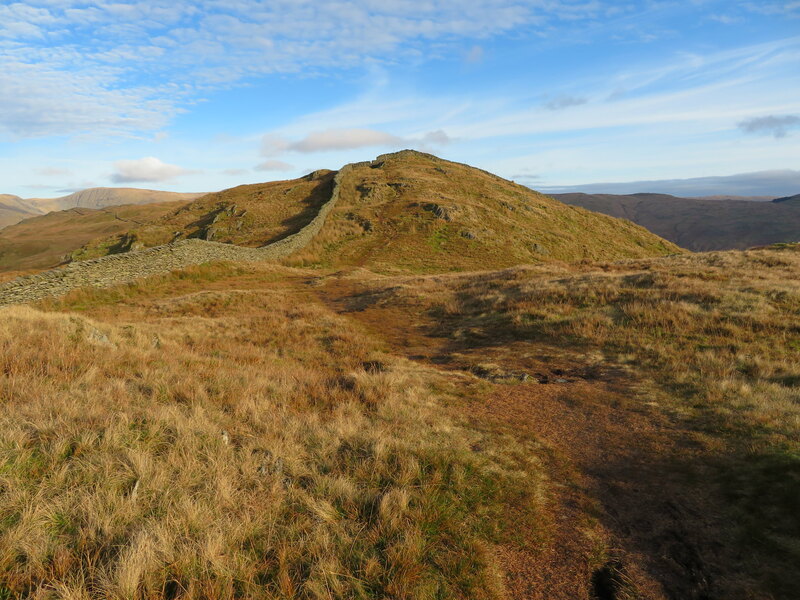 Once on the top of Wansfell Pike it is obvious just why this is such a popular fell to be on as the views are stunning, especially on a day like today. Magnificent all around and we could now see the Kirkstone Pass Inn nestled in the V at the head of the pass. Windermere was stretched out below us but I've seen it in better shape from here in the past as today there was a great bank of cloud sitting over it causing the sun to produce a bright patch on the water that all but burnt out the detail below. Sonny was bounding around running everywhere in a fit of doggie elation when he suddenly made a dart for something that was lying just behind the summit rocks, as he swooped to pick up and run with whatever had taken his fancy there was a call of alarm and a chap popped up who engaged in the race to get at the object first. It's as well that he did as Sonny was just about to get his canine teeth into an £800 camera drone that was being used to take photos of the great lake below us. I had a chat with the drone's owner who showed me the workings of it and the quality of the pictures that were most impressive. It had a battery life of 14 minutes of which he had two whilst he himself was a resident of Ambleside so I suspect that he was a photographer by profession looking at the expensive kit that he had. and as we made fair progress on the downhill we were soon back at Nanny Lane and the gate that would allow us get our boots back on it. and the High Green group - where we had parked - to the north. This part of the village/hamlet plays host to The Mortal Man Inn, but it was closed and I couldn't help but wonder just how many days it has been open since it started its life in 1685. 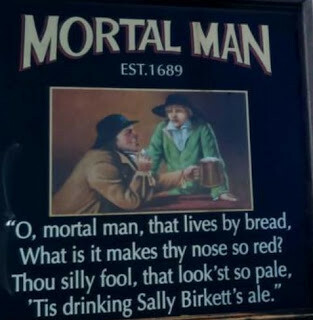 There appears to be many colourful stories relating to the inn and one in particular is in part related on the inn's signboard. The sun was still shining over us and everywhere else and it was just a shame that Windermere was overcast by the large bank of cloud cover otherwise I may have got a better photo had the sky been clear. Never mind, the most important bit of this walk was to get Chris back on the hills and safely down again and that had been done. The next stage is to get him back enjoying a pint of ale of which he can't imbibe just now as he's on medication, but it doesn't stop me having a go and Chris wasn't going to deny me the pleasure of one so we called in to one of our favourite watering holes where I enjoyed my pint whilst Chris competed against me with pint of lime and soda. He'll get there. This has been a pleasurable walk with my walking partner and a good start has been made, we got there and back without much fuss. Chris has only about 30 Wainwright's to complete but he is intent on getting them all done this year. 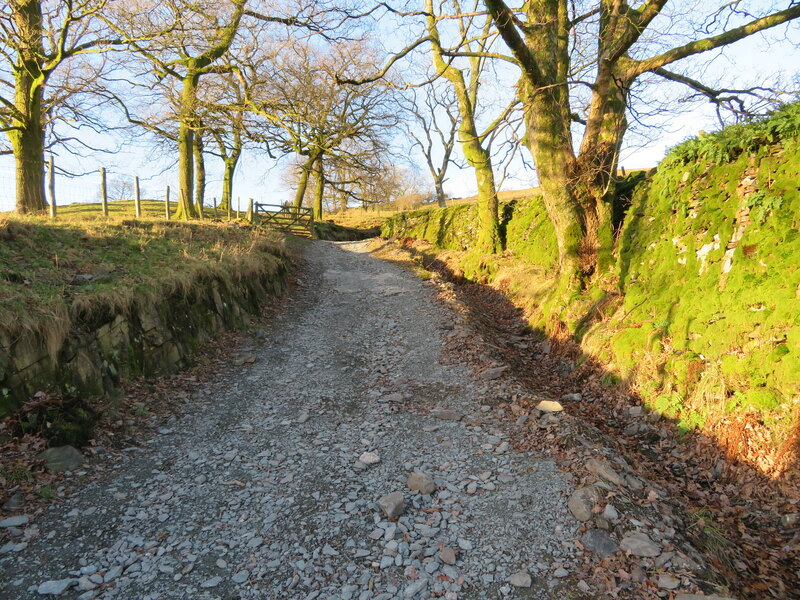 I had already planned our routes for this year, before this problem arose and I shall now have to re-jig them and make them much shorter and more manageable until Chris gets his strength and fitness back. 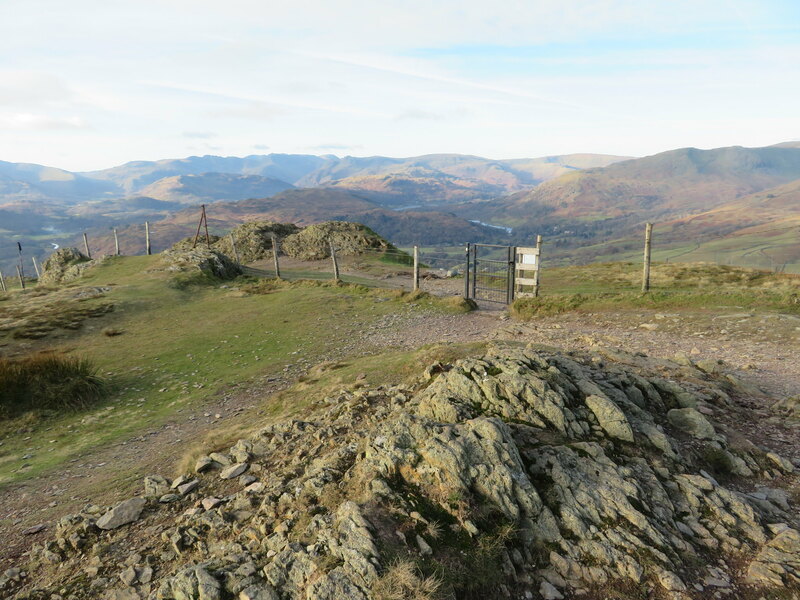 Okay, that means more visits to the fells but that is not a bad thing and fortunately all of the 'big ones' have been done leaving most of the walking now on the more gentle northern, western and north western hills. He will be off work for a few weeks yet but hopes to get more walking in when possible, but as this one was, they will only be short and low as possible increasing only as he returns to his former self. Nevertheless he's enjoyed his day out and mostly pleased with his performance and already making plans for his next outing that he's looking for in a couple of days from this one. 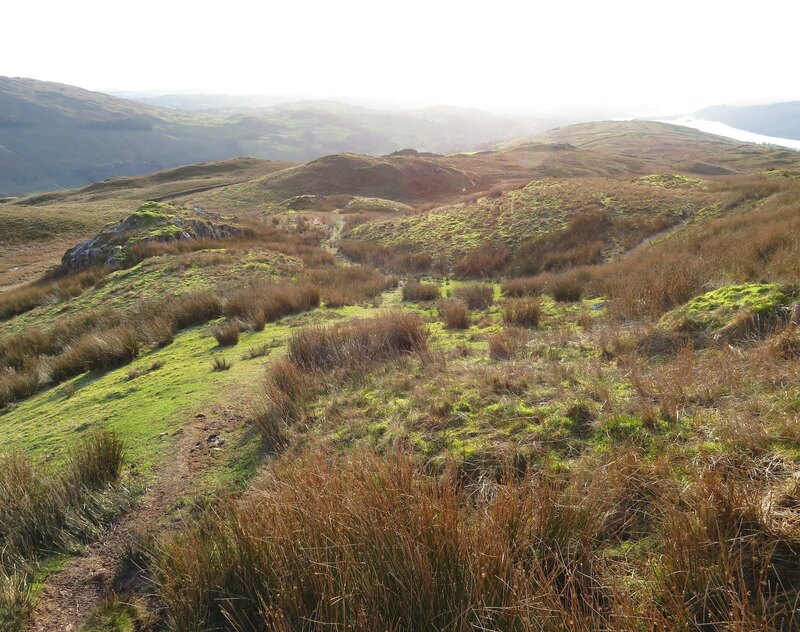 Lovely report trailmasher and all the best to Chris, he'll be out there giving those remaining 30 all the attention they require soon enough, determination is a positive frame of mind, especially when you've a good friend to keep the flame burning bright. martin.h wrote: Lovely report trailmasher and all the best to Chris, he'll be out there giving those remaining 30 all the attention they require soon enough, determination is a positive frame of mind, especially when you've a good friend to keep the flame burning bright. Shocking news about Chris, terrible when something like this hits somebody you're close too. Great to here he's on the mend however. Some lovely shots from what looks a beautiful winters day. 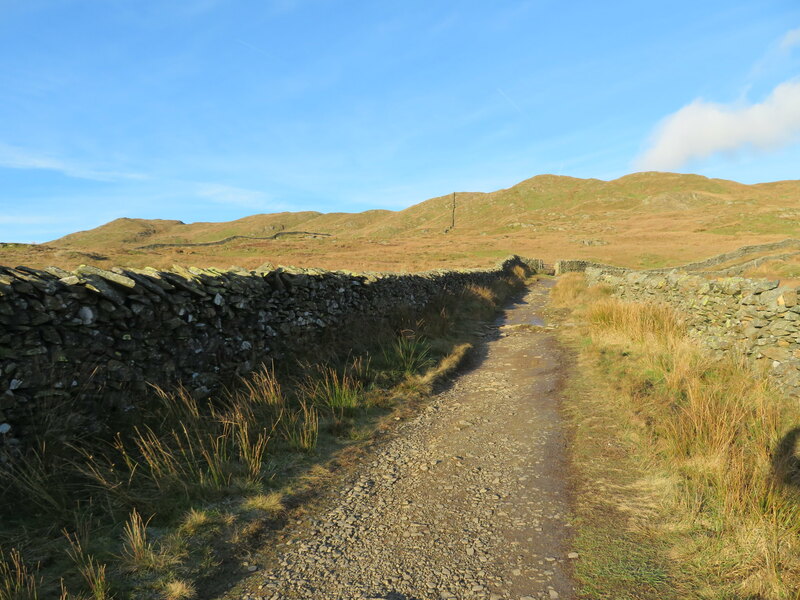 Last time I climbed Wansfell Nanny lane was full to the brim of snow to the extent we could walk straight over the gates. johnkaysleftleg wrote: Shocking news about Chris, terrible when something like this hits somebody you're close too. Great to here he's on the mend however. Some lovely shots from what looks a beautiful winters day. 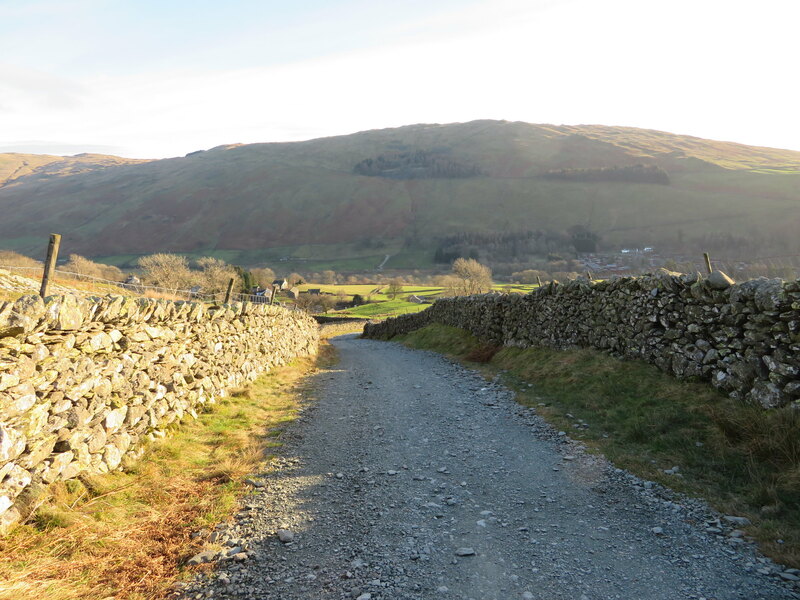 Last time I climbed Wansfell Nanny lane was full to the brim of snow to the extent we could walk straight over the gates. Great report as always Trailmasher. All the best to Chris and hope the recovery continues. Shocking news about Chris, terrible when something like this hits somebody you're close too. Great to hear he's on the mend however.